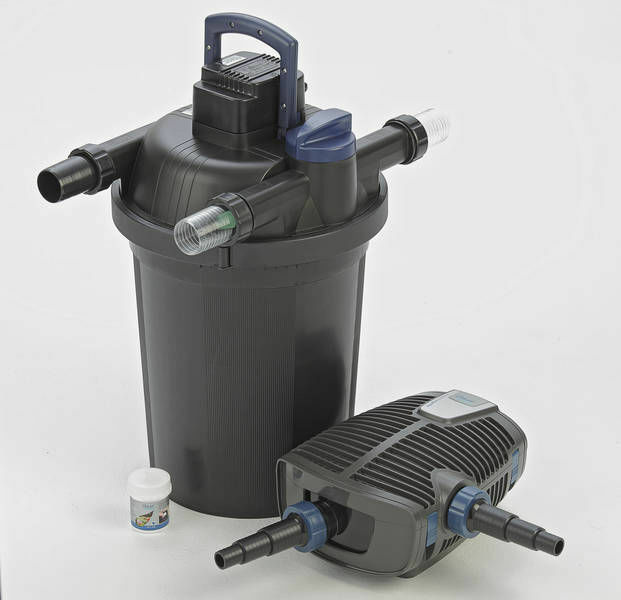 The OASE Filtoclear Set 12000 Premium consists of the Filtoclear 12000 pressurised Pond Filter, an integrated 18 watt UV Clarifier and the energy efficient Aquamax Eco Premium 8000 Filter Pump. 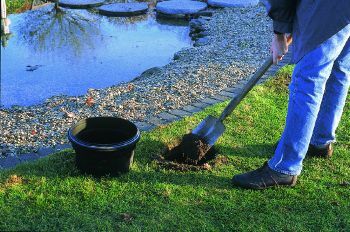 These optimally matched components guarantee crystal clear water clarity in ponds of up to 12,000 Litres (approx. 2,660 Gallons). The pressure filter can be buried up to the head section which makes the filter easy to disguise. 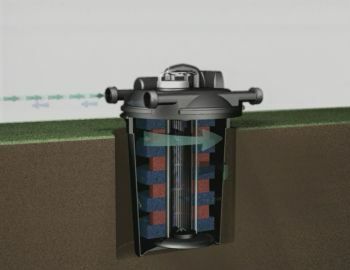 Water can be pumped through the Filtoclear via flexible hose and uphill to a stream or cascade if desired, or directly back to the pond via flexible hose. The optional decorative synthetic stone rock cover will conceal Filtoclear lid from view. Standard 2 year, which can be increased, free of charge, to 3 years by completion and return of the corresponding request card. 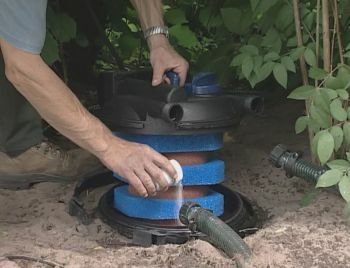 Recommended pond volumes with a raised filter outlet (e.g. 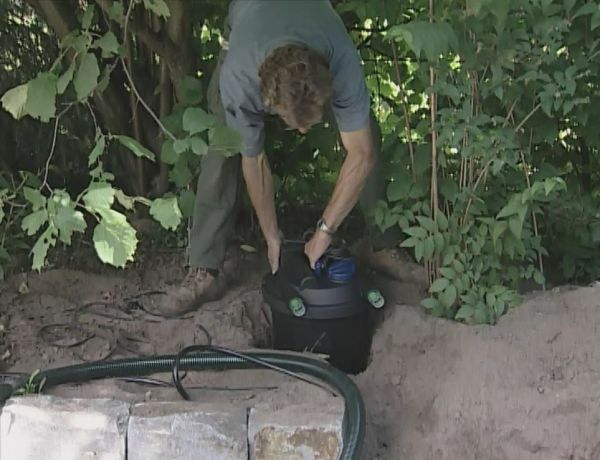 watercourse) at 1 metre vertical lift and with 5 metres of 1 1/2" diameter hose between pump and outlet. Also performance with an optional OASE OxyTex Aerator Set installed. Pond Turnover Rates: The pond stocking levels will determine the required turnover rate which in turn determines the required pump flow rate. Typically, an ornamental pond without any fish will require the pond volume to be circulated at least once every 6 hours; an average stocked pond (with up to 1 kg of fish for every 1000 litres) will require circulating once every 4 hours; a heavily stocked pond including Koi (with up to 3 kg of fish for every 1000 litres) will require circulating once every 2 hours. Filtoclear Set pump selections allow for increased pressure drop across the filter foams as they become polluted with pond waste (see the importance of regular maintenance, below). 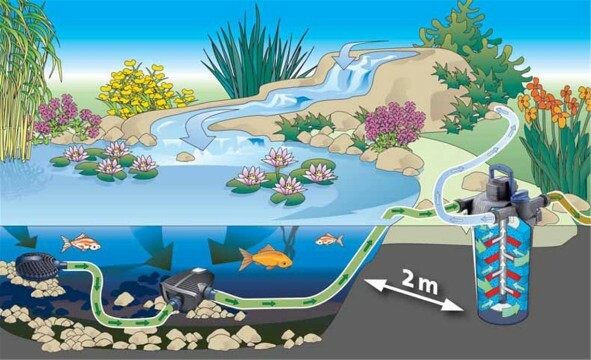 Effect of raising the filter outlet: Raising the outlet pipe height, typically for a watercourse or waterfall, will reduce the flow rate from the pump thereby increasing the amount of time it takes to circulate the dirty pond water through the filter. 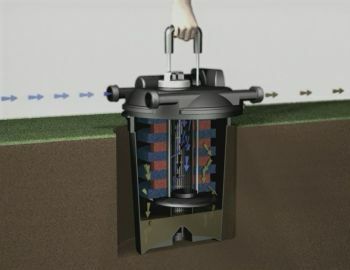 This effectively reduces the maximum pond volume that the filter system can cope with and may mean you will require a larger pump. Please contact us and we would be happy to advise you. Dissolved oxygen (DO) is a major contributor to water quality. Installing an optimally sized OASE OxyTex Aerator Set will substantially improve water quality and fish health and can improve filter performance by up to 25%. 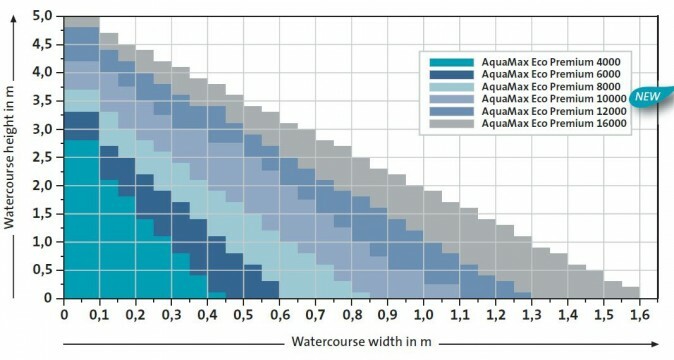 See the chart above for increases in pond volume. The importance of regular maintenance (cleaning): High flow rate = effective filtering. As the filter media (e.g. 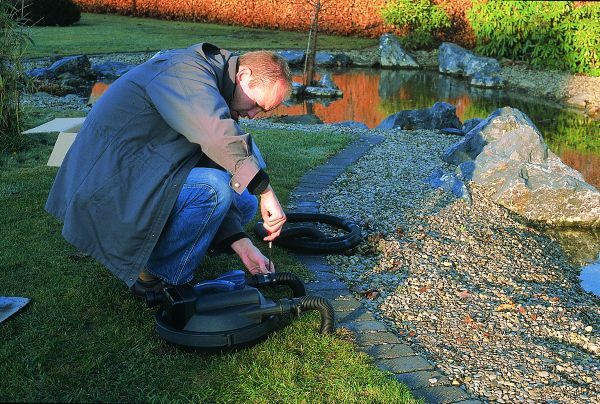 foams) remove dirt and waste from the pond, so the friction loss across the foams will increase, thereby reducing the flow rate and the effective performance of the filter. It is therefore essential, especially for those systems with a raised outlet, to keep the filter foams clean. Fortunately, this is extremely easy with OASE Filtoclear pond filters. 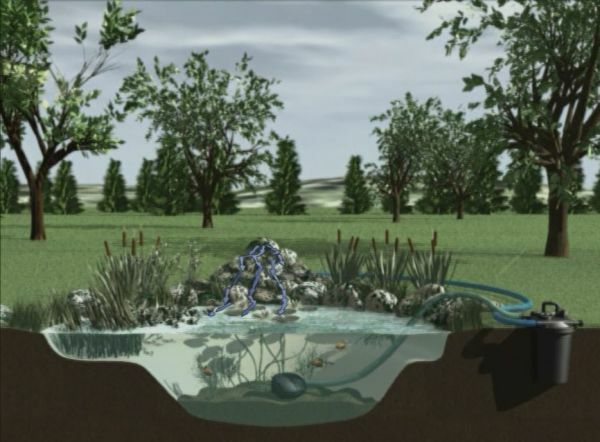 You could split the flow of clean water exiting your Filtoclear filter by utilizing a Y Distibutor, with one branch flowing directly at low level (low head = maximum flow) back to the pond; and the other branch flowing up to the top of your watercourse (high head = reduced flow). By adjusting the Y Distributor outlet valves to suit your preference you can choose to have all or partial flow going to the pond or watercourse. So typically, when there is nobody in the garden you select full maximum, low level flow back to the pond (high level valve closed), thereby achieving optimum filtration. However, when you are in the garden, you can open up the valve to the watercourse to enjoy the pleasant sound of water running down your watercourse. 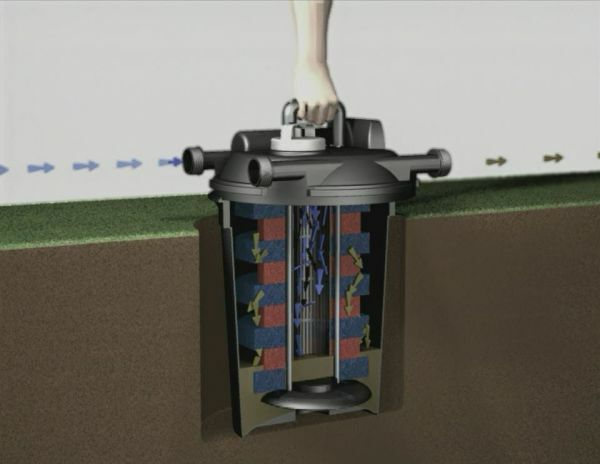 Note, to achieve maximum flow over the watercourse, fully close the low level valve and fully open the high level valve. 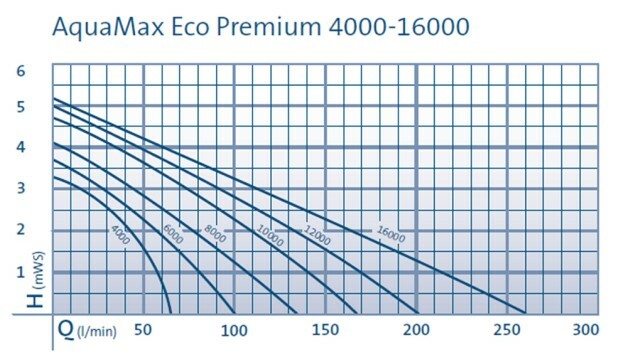 Pump Performance Curves for the OASE Aquamax Eco Premium pump range (4000 - 16000 Litres/Hour).